As the US Figure Skating Championships begin later this week in Kansas City, Missouri, much interest will be devoted to 17-year-old Nathan Chen after his dazzling display of three different quadruples (two toes, a lutz and flip) in his gold medal long program in the Senior Grand Prix Final in Marseille, France last month. Will Chen do it again? Will he add the quad salchow, which those in the figure skating community know he can do and make it five? How far off is he from a long program full of quadruple jumps? Clearly, 2016 has been a landmark year for quads. Not since 2011, when 2009 US Silver Medalist and World Team member Brandon Mroz landed the first quad lutz has a new jump been landed in competition — and we have had two new jumps by two Japanese men: the flip by Shoma Uno and the loop by Yuzuru Hanyu. So naturally, it begs the question when will a man land a quad axel? To put it in perspective, the 4A is worth 15 points if landed, roughly 1/5 of the average men’s technical element score for the long program (75 pts.) and a little less than half of the average men’s TES for the short program (35 pts). With a fall (-3) but actually four points off, the 4A is still worth more than a landed 4S or 4T and almost as much as a 4Lo or 4F. Clearly, the International Skating Union has made it worth the risk. Videos of quad axel attempts in the pole harness can be found on the internet by Max Aaron and Australian Brendan Kerry. Even a doctored 4A video by Singapore’s Mark Leung has over 200,000 hits on YouTube. But probably the best attempt is by Russian Artur Dmitriev, Jr., whose father is two-time Olympic pair champion of the same name — off the pole — and clearly with enough rotation all on his own. Having worked the past two years with Max Aaron for brief periods of time on the 4A and watching 2015 World Team member Josh Farris resume performing his beautiful 3A which flies effortlessly through the air, I definitely think it’s possible and will surely happen someday. During the last month I have been helping 16-year-old Vincent Zhou with many of his quadruples and there are days when I can see “it” in his 3A. As soon as he is stronger to achieve a bit more airtime, the timing, technique and super tight rotating position are already there — as is the desire! Even though it took 10 years between Kurt Browning’s first 4T and Timothy Goebel’s first 4S and then 13 years before Mroz did the lutz, it has taken only 5 years for the loop and flip to be landed. Now that those barriers have been broken, it is only a matter of time before the 4A is achieved. In the meantime, skating fans all over the world will be waiting for the day when the 4A is landed in competition and quintuples are added to the ISU scale of values. I have something very exciting to share with all Club Z members and skating enthusiasts who visit CoachTomZ.com. 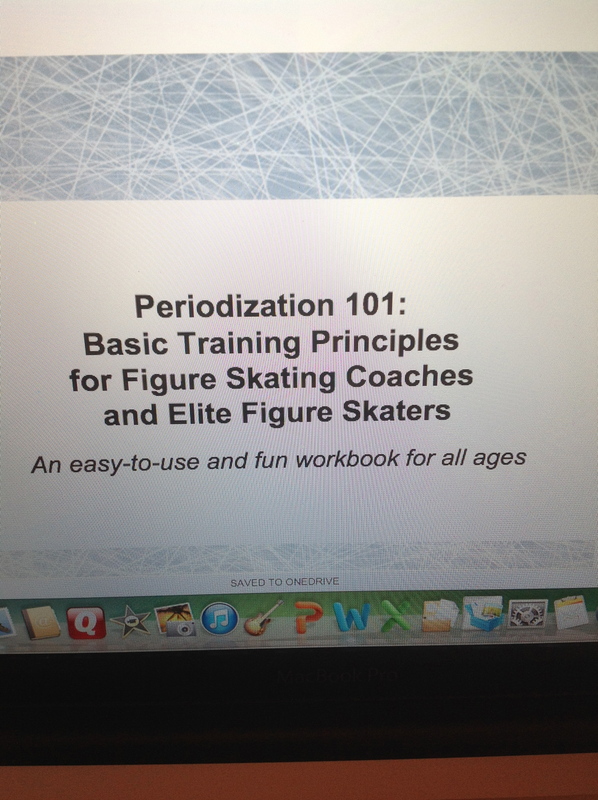 My first workbook for figure skating coaches and elite figure skaters will be available soon. This has been a year-long project that I worked on with fellow figure skating coach Erin Murphy. The topic is periodization and what is so cool about this workbook is that it takes complex theoretical information about training principles and breaks it down into easy-to-understand examples. The workbook will be available on my website in a downloadable and printable PDF format. In addition, there are worksheets to be filled out and a short quiz to be taken at the end of the book. The workbook is currently being reviewed by my friend and distinguished colleague Dr. Bill Sands. I first met Dr. Sands back in 2007 when he was building the first-ever recovery center at the United States Olympic Training Center. We began intensive work coordinating on and off-ice training plans which produced some of my most successful years as a coach. Dr. Sands is currently living and working in Salt Lake City, Utah. About one month ago I began blogging for John Wilson’s website in connection with its “The Perfection To Your Routine” campaign. In addition to a couple of videos in which I actually demonstrate the jumps (Be sure to check those out! ), some of my written topics have included, “The Sound of the Blade: Lutzes and Flips vs. ‘Flutzes and Lips'” and now “Perfecting Your Pre-Competition Routine: Arrival and Practice”. If you check out the homepage of CoachTomZ.com and click on the John Wilson logo it will take you directly to that website and vice versa. Simply click on “Tom Z’s Blog” in the menu bar and you’ll be able to access all of the content. Or use the link below to get there quicker. Be sure to bookmark the page as I will be sharing monthly info on a variety of topics over the next year. By the way, if you have any ideas for topics you would like me to cover, then e-mail me, tweet at me (@CoachTomZ), Facebook me or message me on Instagram (@CoachTomZ). You can use either their accounts or my accounts and we’ll be sure to have a look! In the meantime, make sure to keep working hard toward achieving your goals and have fun with the process so you can SKATE GREAT! 1. Meryl Davis and Charlie White win the first ever Olympic Ice Dancing gold medal for the United States: In their second Olympic Games, Davis and White arguably delivered even better performances than they did in Vancouver where many said they could have won. For their freedance they selected Scheherazade, the familiar music choice of so many previous Olympians, yet they delivered a program so rich in detail and quality that it truly was like no other Olympic program choreographed to the same music that came before them–in any skating discipline. I admit to rewatching it over a dozen times on my DVR. More than a fan, I have watched backstage (and in awe) their evolution from the junior ranks to the fine champions and role models they have become. Thank you, Meryl and Charlie for being great ambassadoors for our sport worldwide. And a special thank you to the parents of these two fine young people. 2. Russian and Japanese dominance in the Junior and Senior Grand Prix: What else can anyone say? It’s hard to argue with such consistent results, performances and dominance. Did you know Russian skaters won 12/24 medals awarded in the recent GP Final? And what about the Japanese singles skaters winning 50% of the medals at the World Championships in Saitama including both the ladies and mens singles titles? Both of these nations and their skaters and their coaches have thrown down the gauntlet to the rest of the world. Consider the challenge accepted. Go TEAM USA in 2015!